What’s the best way to control commercial outdoor heaters? Heaters installed in commercial or industrial areas need to use more energy to keep the large spaces they heat adequately warm. That’s why it’s so important to fit them with heat management functions. Running costs can quickly add up when energy is wasted and installing additional controls can make all the difference when it comes to keeping expenditure as low as possible. Occupancy sensors are one of the most popular energy management solutions for commercial spaces as they will turn the heater on only when people are present. They can be a boon for smoking areas or pub beer gardens where people tend to come and go frequently or stay for varying periods of time. Once people leave the area, the sensor will detect that there is no longer anyone present and will switch the heater off accordingly. Push-button timers work in a similar way but instead allow the heater to remain on for a set time period before switching off automatically. These controls are as useful for domestic spaces as they are for commercial applications because they prevent the heater from being left on by accident – all you need to do is press the button when you want heat and then press it again if the time runs out. Dimmer controls allow heaters to be flexible with their output and provide users with total freedom over their heat levels. A dimmer lets you keep your heater on a low level during warmer days when you may only need a little top-up heat and will also help to keep energy use to a minimum. Some dimmer switches are available with Bluetooth functionality and let you control your outdoor heater from a smartphone or tablet for easy heat management. How many patio heaters do I need for my commercial project? For general guidance on the size of the electric outdoor heater you’ll need, we’ve supplied a ‘heats up to’ value in m2 for every product to give you an indication of its heating span. You’ll need to decide which areas of your space you want to have heated and find a product, or combination of products, that will cover the area. We always recommend over-specifying the requirements of your heated area as wind-chill can sometimes offset the sensation of warmth from infrared heaters. It’s best practice to round your required heated area up a little and choose products with larger outputs to ensure the space will be well heated. Don’t despair if you’re having trouble choosing the right commercial heater for your outdoor project – our sales team are more than happy to offer you advice and can create a free, no obligation quote to your individual specifications. 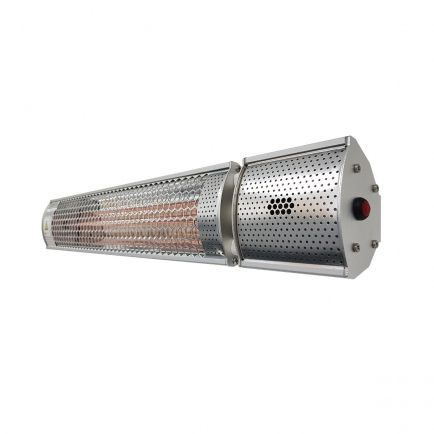 Which are the best patio heaters for pubs and restaurant gardens? Commercial areas require powerful heating solutions which is why we recommend our Burda range for heating larger outdoor spaces. 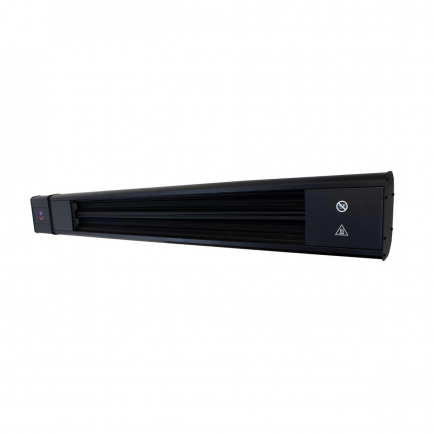 All of our Burda heaters are rated at least IPX4 or higher to provide adequate weatherproofing and our largest heater can warm areas up to 44m². For a more discreet solution that produces no visible light, you may prefer our Herschel range of ceramic heaters that are designed to work in both indoor and outdoor environments. 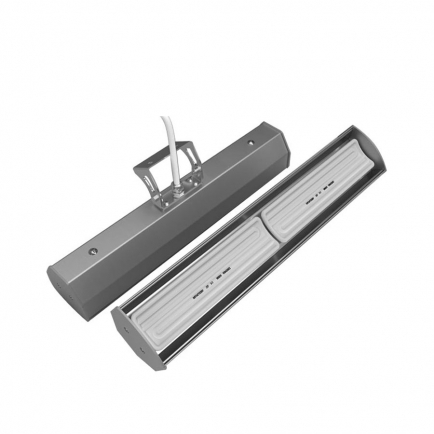 Many of these heaters are also rated IPX4 and will be able to withstand most weather conditions, although they provide a much gentler form of radiant heat compared to quartz heaters so are generally suited to areas that are covered or partially covered. 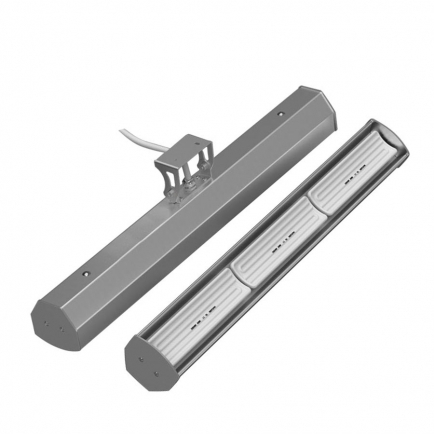 These heaters are popular under canopies near seating areas where the orange glow of a normal quartz heater might be too harsh or obtrusive. Can outdoor heaters be used indoors? 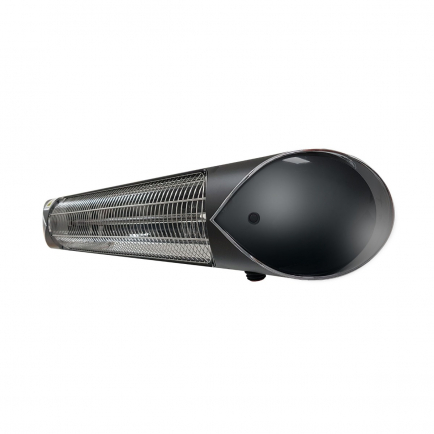 Though they’re referred to as outdoor heaters, many infrared heaters are versatile enough to be used indoors as well. They’re perfect for large, open plan areas like garages and workshops that struggle to maintain a pleasant temperature due to their larger volume and draughtier construction. The direct warmth of infrared offers the same benefits to draughty indoor spaces as it does to outdoor environments. 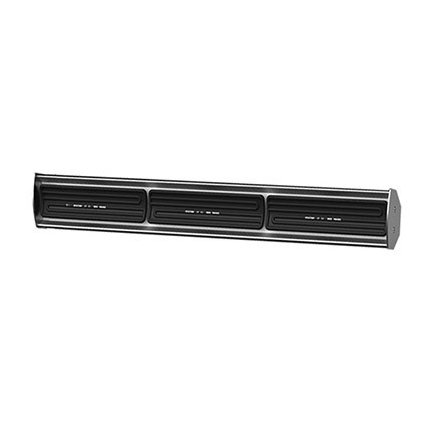 Quartz heaters like our Burda range can be useful for quick, on-demand heat if your workstation gets too chilly, and they also provide a warming orange glow which makes it easy to tell when they’re in use. However, because they use quite an intense form of radiant heat, they don’t make the best choice as a long-term heating solution for constant use throughout the day. The same is true of quartz heaters in domestic environments; while they work well as an occasionally source of heat in rooms like bathrooms or conservatories, prolonged exposure to the heat they produce can become uncomfortable. For spaces that need a dedicated source of heat for long periods of time, we always recommend ceramic heaters like our Herschel products, which use a gentler form of radiation. Ceramic heaters work so well for indoor applications that industrial ceiling-mounted heaters are also available for very large spaces such as car showrooms and warehouses. They also produce no visible light which is preferable if you want a more discreet heat source. What IP rating do I need from my outdoor heater? 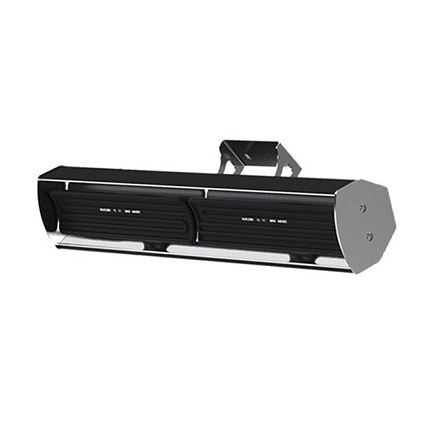 Many electric outdoor heaters require permanent, wall-mounted fixing outside and for that reason you always need to be sure you’re choosing a product that is adequately weatherproofed. You can check a product’s level of protection by looking at its IP rating. An IP rating is formed from two digits, the first representing the level of protection offered against solid objects and the second representing the level of protection provided against water. So an example rating would be ‘IP20’ which would indicate limited protection against the ingress of solids and no protection against water. Any outdoor heater for permanent installation outside should always have a rating of at least IPX4, which indicates the product is protected against splashes of water from all directions. This will usually be adequate for your typical domestic or commercial application that may only be exposed to the odd rain shower. A rating of IPX3 or under will not have enough protection unless it’s installed in a fully sheltered area. For installations in exposed locations, e.g. coastal regions or remote hillsides, you should look for at least an IPX5 or higher rated product which offers protection against jets of water. For more information about IP ratings, take a look at our guide or give our knowledgeable sales team a call. They can give you further advice if you’re unsure about the level of protection you need. Unlike traditional convection heaters, infrared maintains a steady warmth despite breezes and draughty areas as its waves of radiated heat warm surfaces and objects directly. This efficient method of heating can help businesses and commercial establishments control energy consumption and reduce the cost of utility bills. Infrared heating can be particularly useful in difficult to heat open-plan or large spaces, places with an outdoor element such as sports centres and restaurants or areas susceptible to intermittent draughts. For greater control over your heating bills, our range of commercial heaters can be fitted with a compatible timer or programmer.